For over a hundred years the Company has been linked to the University, initially through substantial grants towards the construction of some of the University’s main buildings including the library, science laboratories and the electrical engineering department. Professor Carol Tully, Pro Vice-Chancellor (students) lead the event and John Giffard, Master Draper, presented the students with the medals. These prestigious awards takes into account the quality of a student’s research, teaching, and service to the University and community. 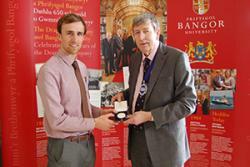 Ben Butler (left) being presented with the Drapers' Medal by John Giffard, Master Draper.Benjamin Butler, 25, from Cranleigh, Surrey, was awarded a silver Drapers’ Company medal and is currently approaching the end of his PhD in Marine Geochemistry. Benjamin completed an undergraduate degree at the School of Chemistry and a postgraduate degree at the School of Ocean Sciences before commencing his PhD in 2012. Benjamin said: "I am delighted to have been awarded this medal in recognition of my contribution as a postgraduate student. I have been very fortunate in the generous support I have received from my supervisor, the Students Union, and the University relating to a number of responsibilities during my PhD. From this support; my involvement in research, public engagement, and university sport, has provided me with a well-rounded and fulfilling postgraduate experience. I hope that this experience, and the recognition from this award, will stand me in good stead as I pursue a career in academia. Benjamin was nominated for a medal by Professor Hilary Kennedy, she said: “Ben is one of the best PhD students that I have supervised. During his PhD he has made a significant contribution to research in polar sea ice environments at sub-zero temperatures. His work is always of the highest quality as evinced by the number of awards and prizes he has gained. 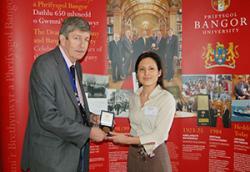 Géraldine Derroire (right) being presented with the Drapers' Medal by John Giffard, Master Draper.Géraldine Derroire, 35, from Clermont-Ferrand, France, was awarded a bronze Drapers’ medal. Géraldine is in the final three months of finishing her PhD on the ecology of tropical dry forests, through the Erasmus Mundus FONASO (Forest and Nature for Society) Doctorate programme within the School of Environment, Natural Resources and Geography.